Little bachelor buttons, some in full bloom and some just beginning to bud, dance around the edges of Garden Romance style. They frame the letters with leaves and petals arranged in a sweet pattern like the steps of a dance. Several letter styles come together here to complement the art perfectly. The main letters, which are for the first names, are on two lines whose ends curve towards each other. The main letters are a banknote style with sharp serifs and an engraved look. Some of the supporting text are on curved lines as well, bringing a sense of lightness to this pretty, flowery style. Customize your Garden Romance anniversary tags today! Garden Romance anniversary tags are printed on one side and are blank white on the back. You have the option to add text on the back for a small charge—just ask! Anniversary tags are printed on extra-thick cover weight white paper and come in a variety of shapes and sizes, including the basic square, a scallop-edged circle, ovals, and other shapes. Anniversary tags come pre-punched with a small round hole to thread your choice of tying material. They are punched out individually and packaged as a set in small bags. 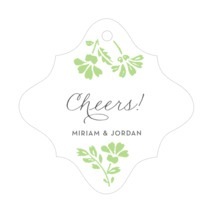 Select a shape and color from above to start customizing your Garden Romance anniversary tags today!